Veteran art dealer Rachel Lehmann had something of an epiphany a few years ago when a curator visiting from Chicago apologized profusely for not having made it to the Chelsea gallery’s Lower East Side outpost during his visit. “He was here for two days and there was so much to see in Chelsea,” recalls Lehmann. The takeaway? “Being less accessible in terms of location just adds another layer of complication. That’s another battle we didn’t want to fight. The critical mass is in Chelsea,” she says. This realization was a crucial factor in Lehmann Maupin’s decision to leave the Lower East Side altogether after that building was sold, and essentially double down in the West Side neighborhood. Today, the gallery opens a stunning new 8,500-square-foot exhibition space spanning three floors in a building designed by Peter Marino adjacent to the High Line. At a time when galleries are working hard to combat a precipitous fall in foot traffic, the location of brick-and-mortar spaces come with higher stakes than ever. Chelsea, which became a hub for galleries migrating from SoHo in the late 1990s, experienced a small exodus in recent years amid rampant construction and soaring rental prices. But now, Lehmann Maupin is one of several major galleries ramping up operations in the area and committing to new, custom-built exhibition spaces. “Chelsea is the capital of the contemporary art world with respect to galleries in the US,” says Lehmann Maupin’s David Maupin. Maupin isn’t the only one who feels this way. Kasmin Gallery is developing an almost full-fledged campus in the neighborhood, opening a fourth space on West 27th Street later this fall. The column-free space designed by Markus Dochantschi of StudioMDA will boast a rooftop sculpture garden. It will launch with three large-scale sculptures by Joel Shapiro, which will be visible to the millions of visitors walking the adjacent High Line. But it’s not only large galleries that are deepening their roots in Chelsea. Celine Mo, a co-founder of Bushwhick gallery Victori + Mo, recently announced a move to the neighborhood. And Burning in Water gallery, founded in 2015, plans to add two new gallery spaces at 507 West 27th Street on top of its current Tenth Avenue location. Some of this real estate shift can be attributed to ample supply. After rental prices peaked in early 2015, there has been something of a glut of available spaces, creating a “leaser’s market,” in the words of David Graff, a commercial real estate specialist at Compass. Graff currently has a gallery space up for lease at $80 per square foot, which “was unheard of a few years ago,” he says. “You couldn’t find a place for $80 a foot unless you were… on side streets in the 30’s over 8th Avenue.” Many landlords are now also offering short-term leases to potential tenants. “It’s what I call ‘to stop the bleeding,’” he says. Meanwhile, Burning in Water’s founder Barry Malin says negotiations for acquiring the new spaces were much easier than they were several years ago for his initial space. “I would say that the climate is characterized by much more accessibility, irrespective of the recognition that we have received as a gallery,” he says. He chalks this up to three factors: less demand overall for retail space in Manhattan; much more commercial space becoming available because of a building boom; and the attrition of art galleries in the neighborhood, particularly small and medium-sized businesses. The building boom in Chelsea has indeed driven the construction of slick spaces that have lured new names to the area. In addition to its standalone gallery, Kasmin has taken space in a new development known as the High Line Nine, a cluster of new purpose-built galleries under the High Line elevated park at 28th Street near a new building by Zaha Hadid. Another mini-cluster of art businesses has sprung up further south, on Tenth Avenue and 21st Street, on the ground floor of a new luxury condo building owned by Sherwood Equities opposite the High Line Hotel. Fred Rosenberg, the vice president of Sherwood, says the company turned away numerous bids from restaurants and other vendors such as a liquor store in order to lease to an eclectic lineup of galleries including veteran Washburn Gallery, Latin American art specialist Nohra Haime, ceramic gallery YSP, and Wilensky Gallery, which deals in mineral art. Rosenberg declined to cite rental prices. Still, the new, high-gloss Chelsea—a far cry from the gritty, warehouse-filled neighborhood that first lured dealers to the West Side—is not for everyone. 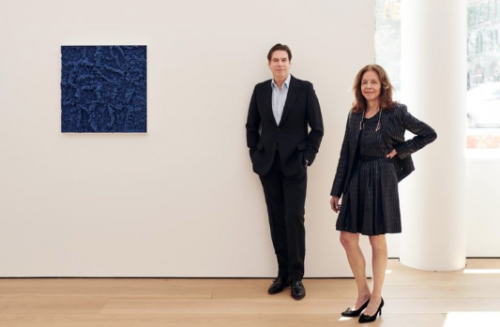 Jonathan Travis, a partner with Redwood Property Group, says the galleries that left Chelsea around early 2015—many of whom he helped relocate—won’t be swayed. Travis has assisted galleries including Casey Kaplan, Bortolami, and Alexander and Bonin relocate from Chelsea to a neighborhood he describes as “northeast Tribeca,” where prices are competitive with lower Chelsea rates. Furthermore, a new generation of power-players such as Lehmann Maupin and Kasmin are committing to buying spaces now, even at higher prices. Rachel Lehmann says the security of not having to move is worth the investment after having been evicted from two “beautiful spaces” in the city after the buildings sold to new developers. Meanwhile, some dealers who arrived in the 1990s are beginning to cash in on their investments. Luhring Augustine and Andrea Rosen recently sold their jointly owned 24th Street space to a developer for $28 million. The purchase price for the building in 1997 was $1.6 million. That’s a hefty 1,650 percent return, Bloomberg estimates. And 303 Gallery owner Lisa Spellman sold a building on 21st Street to a developer in 2013 for $8 million. Though her original purchase price is not known, the gallery is now headquartered in the lobby of the new condo building that went up there.